FABULOUS Manchester Dance Party Hen Weekend! Your hen party is the perfect opportunity to treat yourselves and get away with the girls for one last time before your exciting wedding, so why not go all out with this dance party hen weekend in Manchester, and extend your celebration into two full days. This exclusive package offers two days of fun, laughs and unique hen party activities made to remember. With 2 nights stay in Manchester and some glam activities, you’re sure to have the perfect hen party tailored to you or your bride to be. Your weekend will kick off on the Friday, where you can check in your bags to a premium 3* hotel before receiving your local bar guide and venturing into the city centre. We will provide you with your local bar guide before your hen weekend so you’re completely prepared for a jam packed weekend. This can give you a hand deciding where you want to go for either a few quiet drinks, or where to start an epic hen night in Manchester with your hen group! You’ll also be provided with a nightclub entry pass for each member of your hen group, cutting the queues to one of the best clubs in Manchester so you can get straight to the party. After that the night is totally up to you, so either dress to impress and have a classy night or go all out on the fancy dress and hen party accessories to have an unforgettable hen party with lots of drinks and laughs. After you’ve enjoyed your rooms and hot breakfasts for the first night of your stay, Saturday will begin with a totally unique dance party. This hen party activity can be tailored to you, with over 30 themes to choose from including Beyoncé Single Ladies, 90s and even some Dirty Dancing! Let an experience dance instructor guide you through 90mins – 2hours of warm ups, dance moves and a final performance that all the girls can get involved in. When you’re all danced out and ready for a bit of food, get yourselves all glammed up for a 2 course meal in your chosen Manchester restaurant. Before you start your glamorous hen weekend, you’ll get a choice of popular restaurants around the city centre that offer different types of cuisine including Italian, British and French – so there’s something for every bride to be! Your meal will consist of two pre ordered courses, so all of the hard work is done and you can grab a few drinks, laugh and chat. We’ve also thrown in a second nightclub entry pass for everyone in your hen party, so you can carry on the celebrations till the early hours of Sunday. Nightclub entry means no hassle on the night, no extra costs at the door and more importantly no waiting outside in the cold, leaving more time for partying. Both nightclub entry passes over the weekend will allow you into one of the popular Manchester nightclubs so you can guarantee an exciting atmosphere to finish off your jam packed hen weekend. 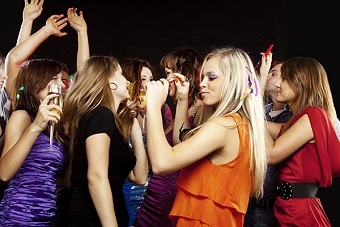 If this Manchester dance party hen weekend catches your eye, give us a call on 0161 341 0052 and our events planners can give you any more info you might need and even organise the whole weekend for you, taking some stress off your shoulders. If you fancy a different kind of hen weekend than this, check out our other hen party packages!